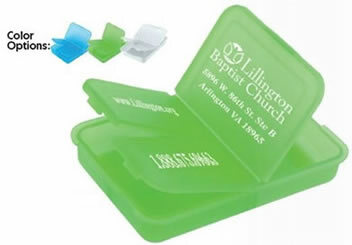 Pill Holders will be a hit as your next tradeshow giveaway. Use these to promote your nursing home at upcoming events and functions. 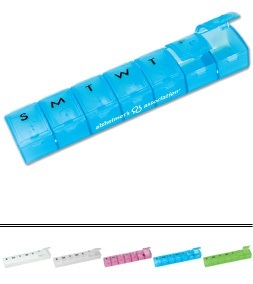 Your nursing home will get a great response from its residents when you have these convenient custom daily pill holders custom imprinted with your facility's name and recipients can fill the plastic pill box with weekly medicine. 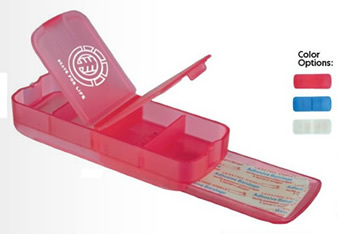 We have a large selection of inexpensive custom pill holders. Pill holders are usually made with compartments for each day of the week and some have sections for different times of the day.